There is One eternal Waheguru who is Oankaar - who is the creator, nourisher and destroyer of all upon this earth, within whose kaar - within whose hukam, within whose command this whole world, this whole universe, everthing is within Waheguru jee's hukam. That Akal Purakh Waheguru is found, is realized through the grace of Waheguru, through the grace of Sathigur prasaadh - through the eternal Guru. Bhagat baav eihu maarag bikharra - the path of loving devotion towards God is bikharraa - is difficult, it's hard, but it's this path that Guru sahibjee talks about in this shabad today. In some parts of the shabad Guru Sahibjee begins by telling us this and as we progress through the shabad Gurujee will talk to our mind, Gurujee will talk to us and tell us that"
Guru Amardaasjee Maharaj is giving us so much love, O my beloved friends thum seh kee bhagath karaeho - engage yourself in the devotional worship, with devotional love for seh - for husband Lord. Guru Amardaasjee Maharaj is telling from the very outset, O human beings attach yourself to the devotional worship of Waheguru. Meditate upon that Guru, upon Siri Guru Granth Sahibjee sadhaa - forever and ever and keep in mind that Guru is your aapanaa - Guru is your mother and father. Naam padhaarath laeho - if you serve the Guru knowing that the Guru is your aapanaa - Guru is your own, Guru is your mother and father, knowing that the Guru is your greatest friend and your eternal friend then naam padhaarath laeho - the Guru will bless you with the greatest naam, with the greatest treasure, with the greatest wealth of naam - of the name of God. Naam is not easy to define but Gurmukh piaareyo naam is the experience of meditation upon God's name, naam is the key through which we are going to realize that the creator of the universe lives within our self. Perform devotional worship, what does performing devotional worship mean? It means follow what the Guru says, sit down with the pothee sahib and read sehaj path of Siri Guru Granth Sahibjee. We may ask that how can we do bhagti? Bhagti means falling in love with the Guru. To have a relationship with anyone you need to talk to them. How are you going to talk to Guru Nanak? - by reading Japjee Sahib. How are you going to talk to Guru Gobind Singh jee? - by reading Jaap Sahib. Fall truly in love with the Gurus, follow what Guru Granth Sahibjee is saying. In the second part of this tuk Siri Guru Amardaasjee explains it Himself, do those things which are pleasing to your Lord God Waheguru, perform those actions that the Guru has asked you to perform. If the Guru says do not slander anyone, do not do nindiya - then make sure you are not doing nindiya of anyone, you aren't slandering anyone. If the Guru says get up and read Japjee then make sure you are getting up and reading Japjee in the morning. If you live your life according to your own will, according to your own bhanaa, according to your own mind thaa fir seh khusee n aaveae - then you'll not get the khusee - the blessings of Lord God Waheguru. Guru Sahibjee tells us that the maarag - the path of bhagtee - the path of devotional worship is bikharraa - this path is hard! Gur dhuaarai ko paaveae - how are we going to learn about the path of bhagti? How can we do it? Only through gur dhuaarai - only through the grace of the Guru ko paaveae - can anyone find this path. Gur dhuaarai - going into the gurdwara physically as well, sit in the sangat, listen to the katha, listen to the keertan, listen to the simran, join in with the simran - this is the way of Sikhi. Another translation of gur dhuaarai is that only through reading the Guru's baanee, through following what the Guru says, through doing that Sukhmani, through reading Japjee Sahib da path, through reading Siri Guru Granth Sahibjee translation's, through reading Siri Guru Granth Sahibjee's baanee - that is the path to learn about this hard path of bhagtee - of this true love for God. Sathiguru Amardaasjee says those who are blessed with kirpaa - with the grace of God so har bhagathee chith laaveae - their consciousness if attached by Waheguru, by Hari into bhagtee - into loving worship, into true devotion. O my mind outwardly you look like a bairaagee - you look like you are detached, thoon bairaag kar kis dhikhaavehi - why are you doing this bairaag? Who are you showing this bairaag to? What does this mean? Many people might get confused here thinking that Guru jee tells us that we need to be detached from the world, we read in banee:Birehaa birehaa aakheeai birehaa thoo sulathaan | Fareedhaa jith than birahu n oopajai so than jaan masaan |36| - this detachment, of separation, this realization of separation from God is what we need, this burning pain inside is what we need in order to begin our bhagtee maarag. But Gurujee is saying that bairaag of the world, outwardly saying O I am detached, O I am really in love with God, outward words and outward gestures are worth nothing, if there is nothing inside. Guru Sahibjee is telling in this part of the shabad, Guru jee is going to go on to tell us that true path of bairaag - that true pain of separation from God. Those people who sing the gun - the praise the Hari they have true sohilaa - they have true happiness inside. Sohilaa - means joy, they have this unending joy inside. Gurujee says give up pakhand - the outwardly shows, all this hypocrisy, give up all your outer shows, kar baiaag and live bairaag - what does that mean? That live in the understanding that I am separated from Waheguru and I need to reunite, that I need to sing the Guru's baanee, that I need to read what the Guru says. So sahu sabh kish jaaneae - live your life knowing this that Waheguru knows everything. 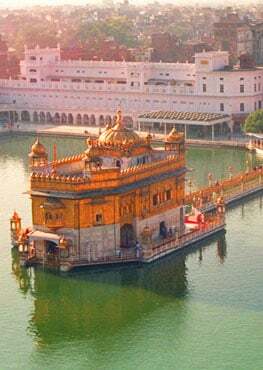 In the jal - in the water, in the thal - in the land, in the meheeal - in the sky, throughout all people and throughout all things eaeko soee - there is that One lord God Waheguru. Guramukh hukam pashaaneae - become a Gurmukh, follow what the Guru says, keep your mukh - your face towards what the Guru says, follow what the Guru says at all times. Hukam pashaaneae - this is the way of realizing and understanding Guru's hukam. People who have pashaathaa - people who have realized the hukam of haree kaeraa - of Lord God Waheguru soee sarab sukh paaveaae - they gain all sukh - all peace, all comfort. What does this mean? Those people live knowing that all happens in Guru's Will, they are forever happy because they know that everything is happening in the Will of their father Waheguru. Siri Guru Amardaasjee Maharaj is now going to tell us what a true bairaagee is, eiv kehai naanak so bairaagee - that person is a true bairaagee who anadhin har liv laaveae - who day and night keeps his or her liv - consciousness focused, attached to Waheguru. Gurujee is saying if you want to live bairaag, if you truly want to live with the realization that we are separated and that we want to join together with Waheguru with that dying love then day and night focus your attention on that Waheguru. Jeh jeh - wherever O my mind thoon dhaavadhaa - in each direction that you wonder in O my mind theh theh har thaerai naalae, what does this mean? Sometimes we are sitting in a room and for sake of this example lets say that that room is in the UK but our mind is in New York with a friend discussing something, mentally we are in France, or mentally we are in India walking through the streets, shopping whatever, doesn't matter what it is. Gurujee says not just physically, but Gurujee is always there with you mentally as well, knowing all your thoughts. O my mind give up all of your clever tricks, God knows them all, God sees them all, gur kaa sabadh samaalae - instead of wasting your time in how to trip up other people, instead of wasting your time in thinking how to slander other people, instead of wasting your time in these things samaalae - meditate upon the sabadh - meditate upon the Guru's baanee. If you meditate upon the Guru's shabad, the Guru's shabad will cut through, will destroy your paaps - your sins of countless lifetimes. Also ultimately, param padh paavehae - you'll obtain the param padh - the highest state of living. What does that mean? Is the highest state of living reserved for people who are rich, is it reserved for people who have a lot of connections politically, No! Param pad refers to those people who are connected to the source of all energy of this universe, Waheguru! Guru jee says saachae naal thaeraa gant laagai, gant laagai literally means tied to, you'll be tied to, you'll be joined with that eternal Waheguru saachae - that Lord God. Guramukh sadhaa samaalae - that person who with his mouth is always chanting the word Guru, Waheguru - the Guru's Words, sadhaa samaalae - forever and ever meditate upon the Guru's Word like that and you'll be tied in union to your husband Lord forever and ever. Sathiguru Amardaasjee says O mind wherever you go, even mentally wherever you go in your thoughts, theh har thaerai sadhaa naalae - forever Hari is with You. You can meet God today, if you just control your bird like desires which are always upsetting your mind, always keeping it wondering around, not staying in one place. If you meet the Guru, the Guru teaches you to purchase the name of God. What does that mean? - to sit down and chant the name of God, to meditate upon the name of God. Naam rehae samaaeae - your mind will merge in with the naam - with the name of God. Sathiguru Jee says that when this mind is thanmiaa - is held down through meeting the Guru then dhasavaa dhuaar paaeiaa - we've found that "Tenth Gate". There are ten gates to our body, ten doors to our body, nine which can be seen - which are physical and the 10th which is unseen and you find that 10th door through the Guru's Grace. It's the same naam which has created and is sustaining the whole world. That Gurmukh piaaraa who has realized through meeting the guru and has reached this stage theh anaek vaajae - there are countless instruments playing glorious praises of God. That person is always in anand, doesn't matter what they are going to, doesn't matter if they are cut in half. Sachae rehiaa samaaeae - they merge in with that eternal Waheguru. In this way meeting the Guru dhaavath thanmaiaa - your mind is which was wondering around everywhere has been held down and made steady. O spiritual being har jee - Waheguru jee is with you at all times. Guramathee - by following the Guru's teaching rang maan, if you follow the Guru's teachings you'll realize that God is within you. If you recognize your origin, where you stem from, then you'll come to know the Lord. Maran jeevan kee sojhee hoee - then you'll realize what is death and what is life. To this day we keep thinking that death is the dying of this physical body and life is the birth. But when we realize that inside there is a soul, and we realize that this soul is eternal and we realize that spiritual life begins by following Guru's teaching. Through the Guru's teachings those who come to know this one Lord Waheguru they have bhaao - they have no other attachments for this material world. Inside you there will well up saanth - peace, inside you you will hear instruments of happiness, of joy playing within you. Thaa hoaa paravaan - in this way you become blessed, you become accepted, you'll realize eternal peace within you. That person who has found peace of course they are going to be happy, vajee vadhaaee - that person is joyous, thaa hoaa paravaan. This is the way Guru Amardaasjee says, man thoon joth saroop hai - O my mind you are that Eternal Light, understand and recognize your roots, your mool, your origin. O human being, O my mind thoon gaarab attiaa - you've overloaded yourself with gaarab - with egotistical pride. Gaarab ladhiaa jaahi - in the end you'll leave this world with ego. You come again and again in jonee - in rebirths, why? - because you are mohiaa - you are attached to this enticer maaeiaa - you are attached to the material world again and again. That's why you don't leave the material world, because you haven't attached yourself to the spiritual world. You cling on to your gaarab - onto your pride: I did this, I did that, I am this, I am that and you leave this world mugadh man - O moorakh man anth gaeiaa pashuthaavehae - in the end when you leave this world you repent, you regret, why was I so foolish, why was I full of ego? You are being attacked by the diseases of ego and greed, birathaa janam gavaavehae - in these things you are uselessly wasting your life. Those people who follow what their mind says, mugadh - who are foolish, chaethehi naahee - they do not meditate upon God. Agai gaeiaa pashuthaavehae - in the next world they regret. Man - O my mind thoon gaarab attiaa - why do you overload yourself with pride and gaarab ladhiaa jaavehae. Siri Guru Amardaasjee says that it is this ego that you are overloaded with, with which you jaavehae and which brings you back again and again. Still on this topic of ego, Guru Sahibjee says don't have so much pride j ho kish jaanadhaa - that I know this, I know that. Guramukh nimaanaa hohu - if you want to become a gurmukh, if you want to follow what the guru says, if you want to devote your life to the Guru then nimaanaa hohu then you'll have to learn humility, then you'll have to live humility. We reply back to the Guru, Guru within me there is darkness, there is spiritual ignorance and my budh - my intellect, my mindset is built upon I, I built upon ego, I built upon me. Guru Amardaasjee replies that sach sabadh mal khohu - if you want to wash this dirt from within you meditate upon the shabad of the Guru, meditate upon the Guru's banee, meditate upon the Guru's mantar. Sahibjee tells us my true weapon is humility, gareebe gadhaa hamarae. Hohu sabhnaa kee raenukaa - become the dust of everyone's feet. If you go in front of the Guru and learn humility then the guru will instill humility within you. O human being do not go in front of the Guru and math kish aap lakhaavehae - and say I know this and I know that. Give up all of your own math, all of your own wisdom and then you'll be blessed with Guru's math, guru's wisdom. This jagath - this world has burnt itself in ego math thoon aapanaa aap gavaavehae - do not lose yourself in this fire, do not be burnt in this fire. Do those karams - do these actions which are in the bhaanai- in the Will of the Guru. Follow the Eternal Guru's Will and build your life upon Guru's Words. Sathigur kai bhaanai laag rahu - forever remain attached to the Guru's Will, to the guru's wisdom. In this way, Guru Amardaasjee says, if you want true happiness give up your sense of aap - your sense of ego. Man nimaanaa hoe rahu - O my mind live your life in humility. Great, blessed is that time when I miliaa - when I met the true Guru. What does meeting with the Guru mean? It means reading the Guru's banee, going to the gurudwara, singing the Guru's banee. What happens when we sing the Guru's banee? We come to think of God - so sahu chith aaeiaa - I started thinking in my chit, in my consciousness of that sahu - of that husband, Lord God. I was blessed with the greatest joy, sehaj bhaeiaa - inside me there is true peace and balance, man than sukh paaeiaa - my mind and body have both found peace. When I remember that Lord God in my chit - in my consciousness, man vasaaeiaa - I enshrined Waheguru in my man - in my spiritual body, deep inside within my man, then avagan sabh visaarae - that Waheguru blessed me with grace that I forgot all of my avagun, I renounced all of my deeds, I renounced all of my vices, I renounced all of my sins. Another way of looking at avagan sabh visaarae is that Waheguru didn't consider my avaguns - my sins. When I started meditating upon my Guru the Guru didn't consider my sins. When it pleased Waheguru gun paragatt hoeae - the virtues appeared, they welled up inside me. Sathigur aap savaarae - Waheguru himself has blessed me with these guns, if you meditate upon that Waheguru who is gun nidhaan - who is the treasure of all virtues then virtues are instilled within you. When you take amrit, Guru Gobind Singh Jee Maharaj is blessing with the virtues of Daya - compassion, dharma - righteousness, himmat - spiritual energy, mohkam - unattachment and sahib - the master within [these are loose translations, I am trying to, with Guru's Grace, keep it as brief as I can]. Sathiguru Amardaasjee says, sae jan paravaan hoeae jinaee eik naam dhirriaa - those who've completely focused upon, to completely be centered upon naam - upon the name of God, of that Ik Akaal Purakh Waheguru. Those jan are parvaan, they've become accepted, they are blessed. Those jans - those humble beings, those humble gursikhs, those humble followers of the Guru have bhaao chukaaeiaa - they've given up attachment to dhutheeaa - to this material world. In this way, Guru Amardaasjee says, dhann s vaelaa - great is that time jith mai sathiguru miliaa in which I met my Guru, my eternal Guru so sahu chith aaeiaa - and I came to think of that sahu - that husband Lord in my chith - in my consciousness. Guru Sahibjee says that some beings are deluded by doubt, thin sahi aap bhulaaeae - Waheguru jee Himself has put them on this path. They wander around in this material world thinking that this material world is going to last forever, houomai karam kamaaeae - their actions are carried out in ego. Our husband Lord had bhulaaeae - has put them upon this path of delusion, kumaarag paaeae - has put them on this path of falsehood. Thin kaa kish n vasaaee - there is nothing in their power. Gurujee is telling us these things because sometimes we look upon people and we say oh that person is despicable, we despise people, Gurujee is saying to us that O human being do not despise these people they are creatures of God, we are all creation of God. O God, only thoonhai - only you know their gath and avagath - only you know their ups and downs, only you know what they go through. Only you know whether the person who is a saint today is going to remain a saint or they are going to become a sinner. Only Waheguru knows that, jin eih rachan rachaaee - who created this creation. Many people had called Sajjan thag - a looter, a villain and then he met Guru Nanak and then all of a sudden he became a saint, sant Sajjan. All of his life Bhumia was known as a chor - as a thief but he met Guru Nanak and he became a Gursikh - a follower of the Guru. Kauda was known as a man eater, a cannibal, he met Guru Nanak and he became a lover of humanity. Your hukam - Your command O God, is kharaa bhaaraa - is the greatest. Guramukh kisai bujhaaeae - but only those people who follow the Guru truly understand this. In this way, Siri Guru Amardaasjee says kiaa janth vichaarae - what are these poor beings, jaa thudh bharam bhulaaeae - when you yourself have put them on this path of doubt. O my great Lord master Waheguru sachee thaeree vaddiaaaee, what does it mean that Your glory is sachee? Today we may praise someone, tomorrow they may do something unworthy of that praise and all of a sudden we start slandering them. That same person who we call a saint today may become a sinner tomorrow, a person we call a friend today may become our enemy tomorrow. The vaddiaaee - the glory, the praises of the world remains for no time at all but God's glory will remain forever. You are the supreme Waheguru Lord beyond this world, baeanth - limitless, suaamee - my Lord master, thaeree kudharath kehan n jaaee - even Your creative power, even this nature cannot be explained. Your glory, Your praises are sachee - are eternal. Jaa ko thudh mann vasaaee sadhaa thearae gun gaavehae - those people in whose man, in whose mind's, in whose soul You have enshrined Your glory they sing Your praises forever and ever. They sing Your glories when they are pleasing to You, sachaee sio chith laavehae - they attach their chith, their consciousness to that sachaa Waheguru. Those people who You Yourself maelehi - unite with Yourself they become Guramukh - they follow what the Guru says and they live their life merged in with You. In this way, Guru Amardaas jee says, sachae maerae saahibaa - O my true Lord God sachee thaeree vaddiaaee - Your praises are eternal and will remain forever and ever. In this shabad Guru Sahibjee is telling us the path: bhagath bhaav eihu maarag - that difficult path of God's love, gurujee is telling us to walk upon that path and Gurujee is giving us the blessings with which to walk upon that path.